Modern technology helps neuroscientists gain a better understanding of how brain activity generates our mental experience – but it simultaneously threatens to undermine the privacy of that experience. In a number of impressive recent experiments, scientists have used fMRI or other brain-scan technology to infer the content of words or images a subject is imagining, or memories she is recalling. In future years, such technology could conceivably allow law enforcement or other government officials to uncover thoughts, feelings, or memories a person is unwilling to share. This chapter raises the question of how we should assess this threat to mental privacy – and what response (if any) US constitutional law can offer to this concern. These questions are the focus not only of this introductory chapter, but of this book’s subsequent explorations of US constitutional doctrine. 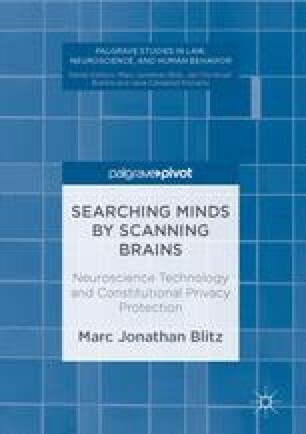 This chapter emphasizes that – in elaborating this doctrine and how it applies to neuroimaging – courts and other legal actors should focus not only on the extent to which specific uses of brain-scan technologies affect the privacy accorded to particular mental states, but the extent to which they might undermine individuals’ more general sense that their unshared mental life is shielded from external monitoring. Childers, N. (2013, June 6). The Video Game Helmet That Can Hack Your Brain, Motherboard Blog. http://motherboard.vice.com/blog/the-video-game-helmet-that-can-hack-your-brain. Stromberg, J. (2013, April 4). Scientists Figure Out What You See While You’re Dreaming. http://Smithsonian.com http://www.smithsonianmag.com/science-nature/scientists-figure-out-what-you-see-while-youre-dreaming-15553304/.